Ecosystem restoration is often driven by a regulatory requirement, which makes the voluntary improvement of a 30-acre section of urban oasis including forest, meadow, and shoreline quite unusual. What is even more extraordinary is that this island of tranquility is located in densely populated Cambridge, Massachusetts and within sight of downtown Boston. Better known for its universities, including Harvard and M.I.T., the City of Cambridge is also home to the 325-acre Fresh Pond Reservation, half of which is comprised of the land that surrounds and protects the 162-acre reservoir, which provides the city with drinking water. The landscape restoration effort, begun a decade ago, is designed to increase the protection of the water supply, as well as to enhance the extensive recreational use that the park supports. 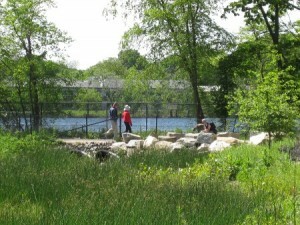 Constructed stormwater treatment wetland surrounded by walking paths within Fresh Pond’s Northeast Sector Project area. Since European settlement, the Fresh Pond Reservation area has been occupied by resort hotels, clay mining operations for brick-making, ice cutting and storage, farmsteads, and rail lines. In the 1890’s the Olmsted Brothers, landscape architects, prepared a design plan for the Reservation. The Olmsted plan featured extensive topographic alterations and planting of mainly native trees and shrubs. The form of the Reservation today is largely the product of the Olmsted plan. However, the Olmsted plan did not provide guidance on how to maintain the naturalistic landscape that it created. In the century since the Olmsted plan, many of the trees planted have grown into magnificent giants. However, during that same period, human use of the Reservation has also greatly increased, including runners, families, and pet owners. Over time the Reservation’s natural areas, stressed by increasing use, have deteriorated. 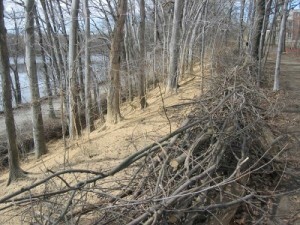 Soils, particularly along path corridors, have become compacted and eroded. Woodlands have been overrun with invasive shrubs and vines which have crowded out the native plant communities intended by the Olmsted plan. Giant trees have been choked by vines, shortening their lives and creating a public safety hazard. Wildlife habitat and aesthetic values have been compromised. 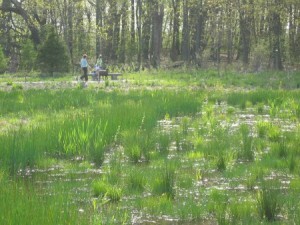 In the 1990’s, a century after implementation of the Olmsted plan, the Cambridge Water Department and the public recognized that the Reservation’s natural areas needed help. In 1999, the Fresh Pond Natural Resource Stewardship Plan was completed which inventoried and provided stewardship recommendations for the Reservation’s vegetation and soils. In 2001, after an extensive public process focused on stewardship goals, the Fresh Pond Reservation Master Plan was adopted with the interrelated goals of preserving Fresh Pond Reservoir’s water quality and improving natural area health and the habitat value of its surrounding watershed lands (The Reservation). The Master Plan recommended a number of landscape stewardship projects to revitalize the Reservation’s natural areas. John Amodeo is a Project Manager and Landscape Architect with Carol R. Johnson Associates Inc. (CRJA) of Boston, which led the restoration design team since the project’s inception. Armodeo believes that this effort was distinguished by the close integration and execution of a landscape management plan, featuring selective vegetation cutting, with the ultimate native replanting effort to follow. This management-design integration greatly supported efforts to reuse natural resources available on site to the greatest extent. For example, all acceptable cut material was reused on site for soil enrichment purposes. Related to this, Amodeo adds, the project also succeeded to a large degree in reusing existing on-site soils. This reuse philosophy helped cut costs, allowing more budget for the substantial replanting effort. With the project’s completion in 2008, some 25 diverse acres of previously unmanaged, overgrown forests, old fields and edges experienced intensive management focusing on removal of invasive plant species and extensive replanting of native species. Large strides toward restoration of native forest, meadow and edge ecosystems, including the soils beneath them, have been made. One of the Master Plan’s major implementation projects was the restoration of the Northeast Sector of the Reservation. Two of the main site features include Lusitania Field, previously a construction staging area, and Neville Place, an assisted living and skilled care facility located on the property. 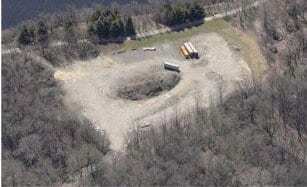 For years a public works yard had been located adjacent to the Neville facility. Past damaging uses and impacts spilled over into the surrounding natural areas resulting in extensive deterioration from invasive plant species and ecological values suffered. Lusitania Field was first a highly disturbed soccer field built on top of excavate from the extension of the MBTA's Red Line to Alewife and then a construction staging area. Biodiversity was reduced as these natural areas became dominated by a few invasive species. Large oak and sycamore trees, planted over a century ago, did not produce younger trees because the forest floor was completely shaded by the invasive buckthorn shrub. Few bird species nested in buckthorn losing important habitat opportunities over time. Steep slopes were trampled and the fragile topsoil layer washed into the Reservoir during heavy rains. Important old field habitats lost their distinguishing open character as vines took over and strangled adjacent trees on the surrounding woodland edges. Visual differentiation of the underlying rich diversity has become hidden under the weeds. Constructed treatment wetland cleanses stormwater naturally before discharging to Fresh Pond Reservoir (rear) within Northeast Sector Project area. During the period 2001-2005, the Northeast Sector plan was prepared to repair these damaged natural areas and to preserve the Reservoir’s water quality. In designing the solution, “principles of sustainable design were always first and foremost in our minds, and key to addressing the Master Plan goals and objectives,” says Amodeo. Numerous public meetings were held to get input on the proposed remedial measures and to help ensure that the design team incorporated the Master Plan goals. The project team, including all needed disciplines, was carefully assembled with a focus on sustainable design. CRJA led the team, and I was included for landscape management planning, specifically to oversee the careful implementation of the Stewardship and Management Plans. Pine & Swallow Associates provided strong credentials in earthwork design, specifically in dealing with damaged and potentially contaminated urban soils, and special experience in soil engineering and identifying contaminated soils. Pine & Swallow were well-suited to recommend complex soil engineering needs of site. Bartlett Tree Experts prepared tree inventory and analysis and made treatment recommendations for trees greater than 12” DBH (diameter at breast height) on site, of which over 1,100 were identified. Julie Messervy incorporated a certain aspect of public art into the design approach, and Precision Land Surveying provided extensive survey which distinguished between landscape and vegetation zones beyond that normally required for topographical survey. The contract to implement the work was awarded to Emanouil Brothers Inc., a landscape company with extensive restoration experience. The contractor team included Groundscapes Express (Eastern Landscapes), specialists in erosion control and low impact development (LID) installation focused on stormwater management. Work proceeded from 2006 to 2008. The Landscape Management Plan provided the first step toward restoration. The goal was to improve the overall health of the forest, to reopen overgrown meadows, and to reclaim important native thickets on the edges between the two. The Reservation being home or way station to hundreds of permanent and migratory bird species traveling the Atlantic flyway, the Plan particularly focused on improving avian habitat. The Management Plan divided the site into 22 sub-areas based upon vegetative character and provided detailed instructions on managing both native and exotic invasive species from groundcover layer through shrub and understory forest strata to overarching canopy trees. 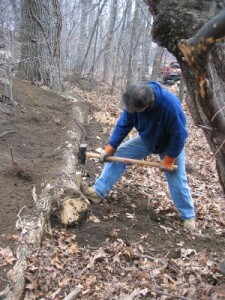 Using the latest low impact urban forestry techniques, some native trees, such as oaks, ash and poplar, were selectively cut to create more space for the remaining trees to grow more vigorously. In some cases, native trees were cut to reopen former ecologically important old fields that had grown in over time. On slope areas, some native trees were cut to allow more sunlight penetration to the forest floor. This has improved growth of groundcover, shrub, and understory tree forest layers which were poorly developed or entirely absent. To control their spread through the forest, many of the trees removed were invasive species, such as Norway maple and Tree-of-Heaven, considered damaging to ecosystem health. Similarly, extensive cutting of invasive shrub and vine monocultures occurred and were focused most notably on Buckthorn species and Oriental Bittersweet. Removal of these aggressive invaders has enhanced opportunities for native shrub and groundcover communities to reestablish in these degraded areas. In some cases, herbicides were applied to control invasive species growth. Any herbicide use was very closely controlled and focused directly upon target species using primarily “direct stem” application techniques. Applications occurred in the late summer and mid-winter, respectively the most effective seasons for chemical controls on the target species. Herbicides can be safely and effectively used by qualified professionals, even near public water supplies. Selective tree cutting and extensive invasives removal has also created a much improved aesthetic experience for reservation users. Removal of thickets of buckthorn and bittersweet vine exposed natural treasures like century old oaks, sycamores, maples, and hickories long hidden from view and literally falling to pieces under strangling vines. Fresh Pond’s Northeast Sector Project emphasized low tech, innovative restoration approaches including the reuse of on-site materials. To improve forest health, hundreds of selectively cut or pruned native trees were used to rebuild eroded soils and to enhance regeneration of native forest communities. One of the most notable reuses was the embedding of log bars on formerly eroded and compacted slopes where untreated stormwater has rapidly runoff into the Reservoir carrying with it heavy sediment loads and dog waste. Log bars greatly slow runoff rates. They also capture solids and organic matter which then turn back to soil as the logs themselves slowly decay, enriching the humus and topsoil layers. Placed in the early spring at the beginning of the project’s installation, many of the log bars soon began to re-sprout sapling trees, further stabilizing these slopes. Brush barriers constructed from the limbs of cut and pruned native species provided yet another notable opportunity for resource reuse. These barriers proved highly successful in keeping park users and their dogs off rejuvenating slopes while the understory regenerated. The reuse of native wood in this fashion has in essence accelerated the recycling of organic matter throughout the managed area. Brush barriers created with cut and pruned native trees helped keep foot traffic off rejuvenating slopes. In addition, compost-mulch and bonded fiber matrix, two organic materials that are applied from blower trucks, provided an early protective cover to formerly bare soils on forested slopes. Much of the compost-mulch slurry contained seed mixes of native groundcover and understory grasses and shrubs such as Little Bluestem and native dogwoods. During record rainfalls in May and June 2006, just following application, little or no movement of compost-mulch occurred on any slopes and slopes have been stable since project completion. Amodeo says that “a key project feature was the reuse of a derelict soil pile for topsoil throughout project area. During the design phase this soil was tested and analyzed to determine soil’s viability for reuse, if any. Pine & Swallow determined that once modified with sand and organic material this soil could be reused for topsoil. In the end, this soil provided some 5,000 cubic yards for reuse. In the larger sense, this prevented having to bring in expensive soils from elsewhere, stripping agricultural soils, and saved money for other aspects of the project. This practice of soil reuse is too often overlooked on other projects,” noted Amodeo. Amodeo points to the Master Plan’s extensive native plant lists as particularly helpful in guiding the design response. 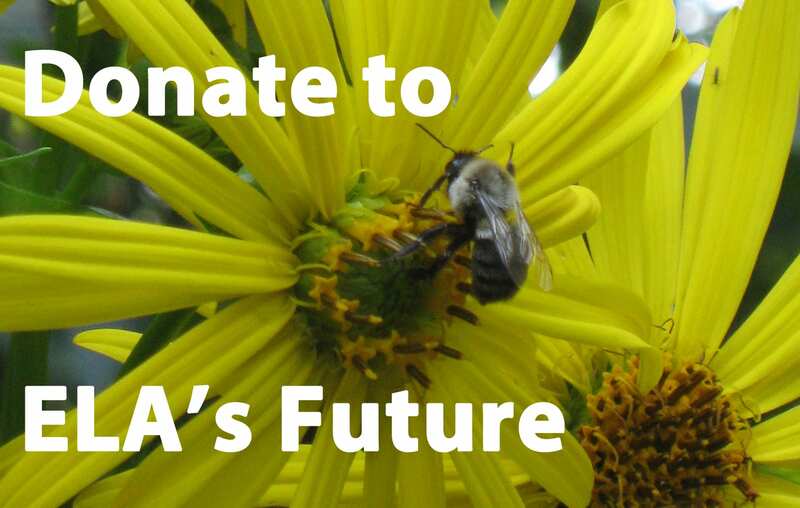 “We analyzed species plant-by-plant for appropriateness. 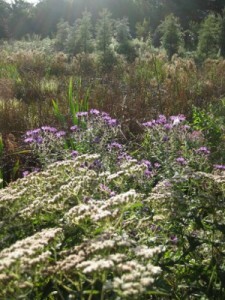 All plants were native to eastern Massachusetts. 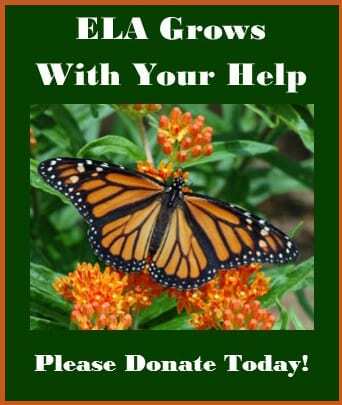 We also brought in our prior experience with projects at the Reservation to tailor the ultimate plant list to what works in a public setting while editing out what does not.” That said, the project’s final plant list contained hundreds of native species. Plantings of virtually every commercially available form and type is to occur, including grass and fern plugs, bare root shrubs, seedling, sapling and specimen trees and extensive seeding. Edge zone and forest understory plantings included species such as Winterberry, Pagoda Dogwood and Musclewood and helped fill in these particularly deteriorated niches. Live stakes, cuttings from existing native shrubs including mature onsite gray dogwoods stands, were reused as plantings in newly created wetlands where they rapidly established cover and shade over channels. Native biodiversity increased exponentially with the extensive planting of natives here. Fresh Pond’s Northeast Sector project combines beauty with function, achieving multiple goals, as evidenced by constructed stormwater wetland. Highlighting the overall composition is a two-acre upland wildflower meadow adjacent to Neville Place and a four-acre natural stormwater treatment wetland covering much of Lusitania Field. Of the later, Amodeo says that previously untreated runoff from two adjacent wooded areas that regularly drained to the Reservoir now runs through a densely planted natural filtration system which removes solid and particulate matter. The constructed wetland also returns the field area back to its original wet meadow and marsh condition as noted in the Stewardship Plan. An innovative trench system further helps support the constructed wetlands. Constructed trenches were cut through an existing nearly impermeable “fragipan” clay layer and now establish free flowing surface and groundwater between the new wetland and the surrounding areas, feeding the wetland during dry periods and allowing for overflow and groundwater recharge during wet periods. A number of new universally accessible (ADA) trails winding through the woods and fields tie it all together. A number of these trails were constructed with stabilized aggregate which allows runoff to percolate through and back into the substrate further contributing to groundwater recharge. A self-guided tour brochure for enriching public understanding of the project and its ecosystem is available from the Cambridge Water Department. Construction of the treatment wetland was significant in that it returned a disturbed and filled portion of the site back to its historical wetland condition. The transition between this constructed wet meadow and the surrounding woodlands is perhaps the most ecologically rich in the project. It has been said that birdsong along this edge can be deafening at sunrise. One of the most special features of the project has been the reintroduction of historically and culturally significant native trees. “The project site and goals have gone full circle to foster establishment of two experimental groves of culturally native elm and chestnut trees. During the last century both species were decimated by exotic disease blights, the Dutch elm disease and the chestnut blight, respectively. The project area will ultimately include a grove of Valley Forge and New Harmony elms, native genotypes that have only been lab tested not street tested. Similarly, a grove of Bartlett Chestnut trees will also line a new path. The project lends itself to this type of experimentation with long-term research benefits to be derived,” noted CRJA’s Amodeo. Amodeo explains that, “Since the beginning of the project, we’ve always recognized that proper monitoring and maintenance would be critical for long term success in preserving the value that comes from implementing this project. 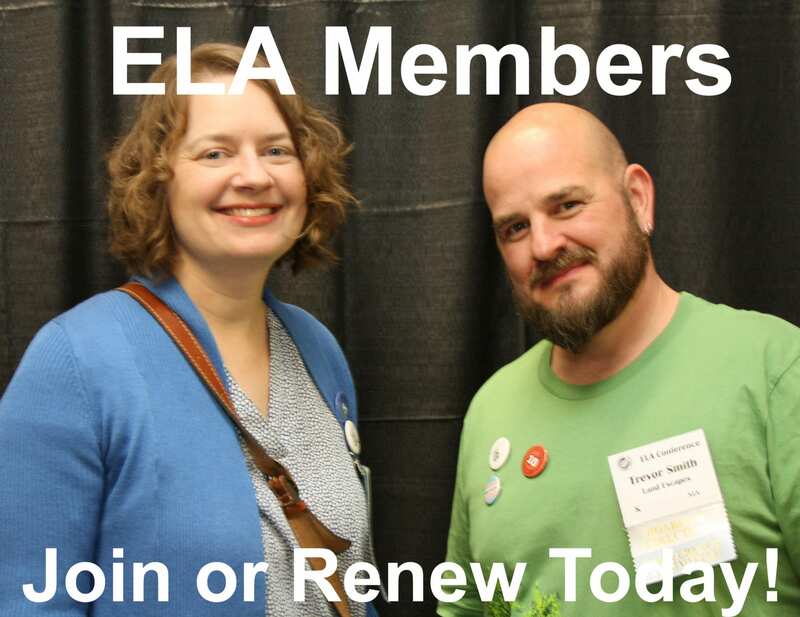 Three years of limited monitoring was required by environmental permitting process. But the really important step is the larger scale, ongoing monitoring and maintenance effort to be undertaken until the forests and meadows reach a stable condition.” In 2008, the Cambridge Water Department took over maintenance of the site. The city purchased a pint-sized maintenance “pickup” vehicle to regularly traverse pathways designed at the proper width for small motorized equipment. Typically, care for meadow and open areas will require well-timed but infrequent mowing (based on observations in the field) to discourage weeds. In some cases, over-seeding with native species is necessary. Woodlands will require repeated invasive removal efforts until either the invasive seed source is depleted or root zones have been sufficiently depleted of nutrient storage. The Water Department has also worked with a number of local volunteer groups to help with ongoing invasive species control. In places where more light is now reaching the forest floor some new invasive stands may develop alongside young native stands, and selective removal will have to occur. However, the goal is to have within five years stable ecosystems that require infrequent but targeted maintenance regimens. Restoration of the 30-acre Northeast Sector shows off the Reservation’s full potential as a natural haven in the city. This project has set a new standard for reestablishing biodiversity in urban forests with its emphasis on reusing the resources close at hand. The City of Cambridge’s vision includes today’s wise stewardship and restoration of the Reservation’s natural resources as well as the legacy left for future generations of park users, from both the human and natural communities. The Northeast Sector project won the Boston Society of Landscape Architects’ Honor Award for Restoration and Reclamation in 2009. Find more information about Fresh Pond Reservation at http://www2.cambridgema.gov/CWD/freshpond.cfm and information about the Northeast Sector Project at http://www2.cambridgema.gov/CWD/Northeastsector.cfm. 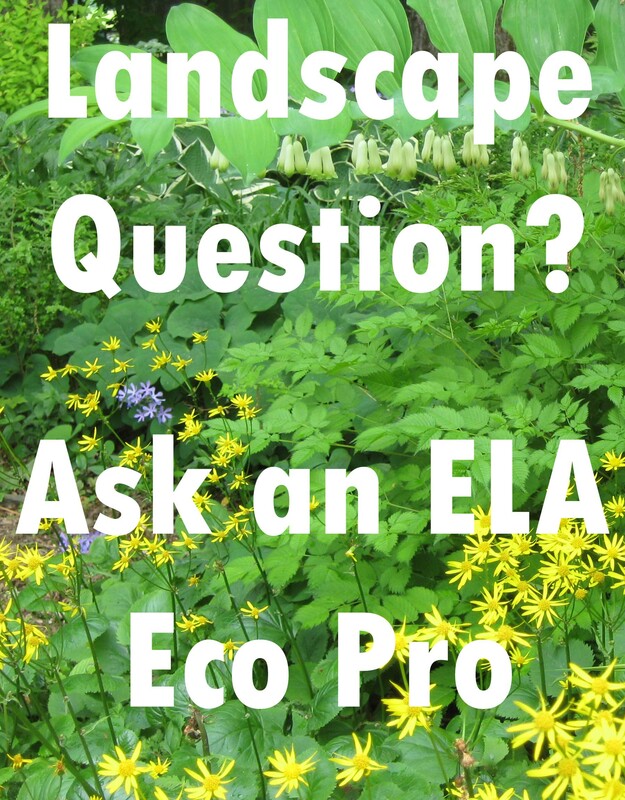 Thomas Benjamin is a registered Landscape Architect and LEED Accredited Professional (AP) and educator with more than 20 years experience in environmental design work often focused on ecological restoration and green design. His restoration experience includes assessment, design, and construction of upland, wetland, riparian and coastal sites/properties using low-tech bioengineering solutions. His site planning work emphasizes low-maintenance native plantings for public facilities, commercial, institutional, residential developments and private residences. His work has often encompassed creation and enhancement of natural stormwater filtration systems in both developed and natural contexts. Tom may be reached at benjamintom1@gmail.com. Register now for a guided tour of the Fresh Pond Reservation Restoration area on October 21, 1-3pm with Thomas Benjamin. Porous Surfaces – How Are We Doing?